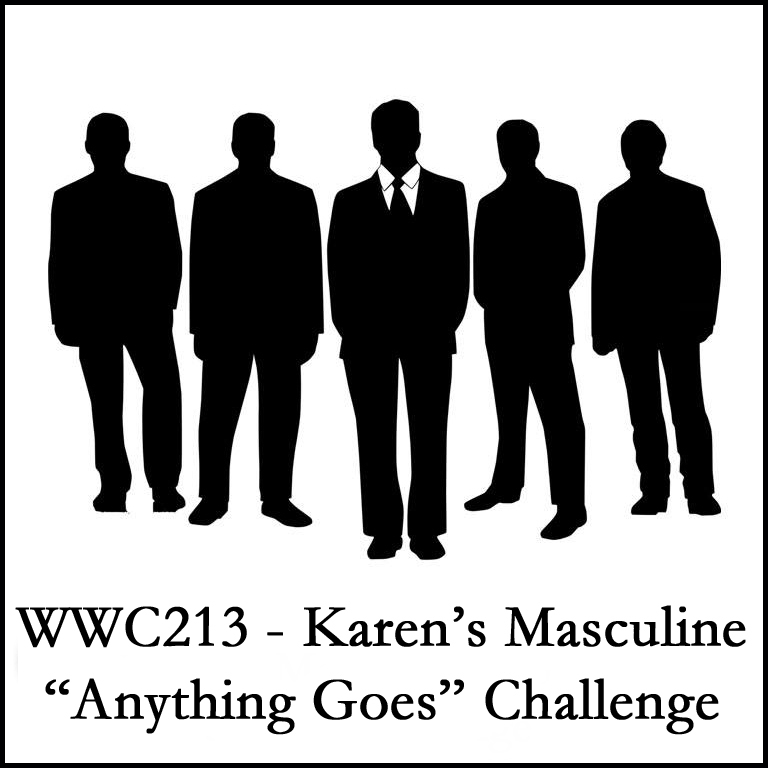 How serendipitous it is that this week's challenge is for a masculine card and I need one for my brother-in-law's birthday! Finally, I get to use that gorgeous Let It Ride stamp set. My brother-in-law loves horses and the great outdoors. 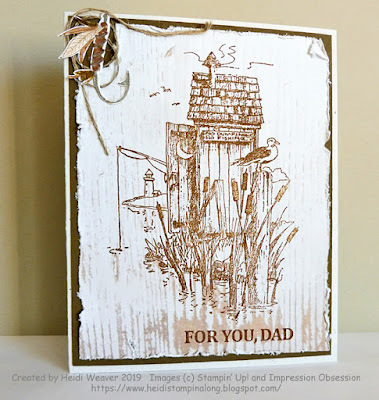 What better way to use some of the images from this set than to create a watercolour background and then carefully do my stamping? I used a combination of Soft Suede and Crumb Cake inks for the mountains. Then I added some Balmy Blue for the water and, finally, some Mossy Meadow for the grass. 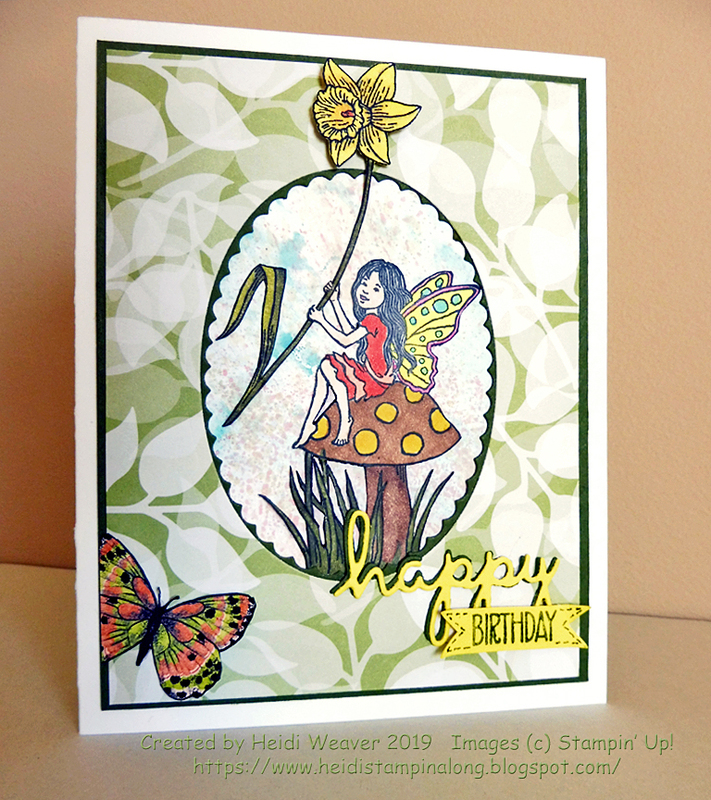 Once that had dried, I stamped the trees using Mossy Meadow and then stamped the image again just to the side of the first stamping without re-inking. The darker and lighter trees add depth to the background. 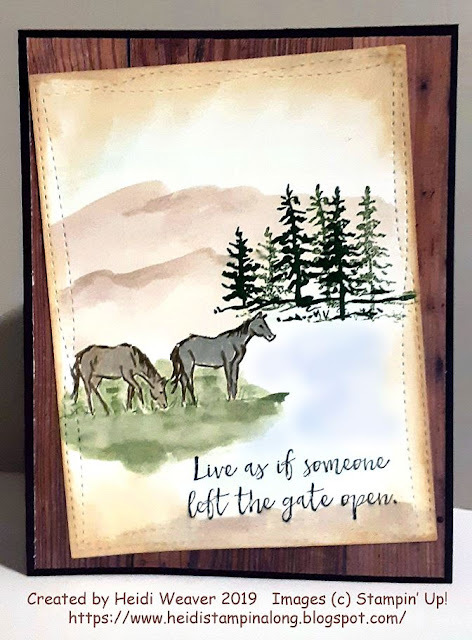 I stamped the horses using Basic Grey ink. To colour them in, for the one on the far left, I used a combination of Crumb Cake and Sahara Sand and for the one on the right, I used Grey Granite. To finish up, I sponged the edges using a combination of Soft Suede and Crumb Cake. My base is Early Espresso followed by a layer of that lovely and sadly retiring Wood Textures Designer Series Paper. I love how the colours work together for this card, don't you? 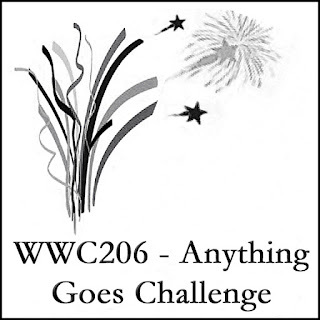 I hope you'll check out the wonderful creations by the Watercooler Artists over at our Watercooler Wednesday Challenge. Sometimes an occasion is no more than a wish to brighten someone's day. Isn't that an awesome reason to send a card? That's what I've done for Dawn's "All About Occasions" Challenge, by mixing together the Sweet Storybook and Fable Friends stamp sets. I mounted the separate flower on top of the flower which was part of the image, using a small Dimensional foam and some Tombo white glue. I wanted the petals beside the squirrel's face to be flat against him instead of raised. 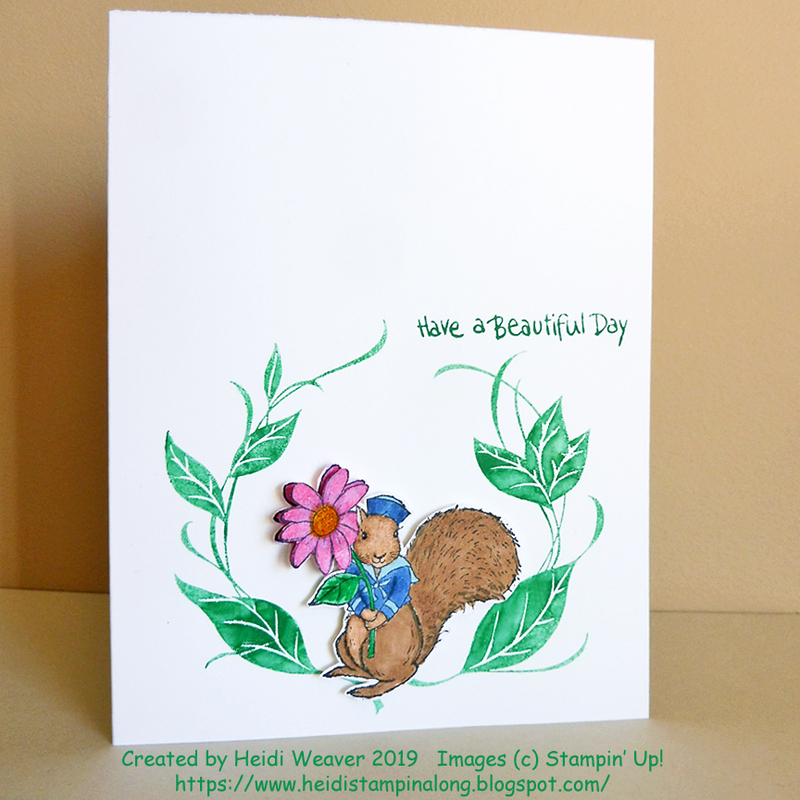 Then I added Dimensional foam pieces all over the back of the squirrel and flower image and mounted that at the base of the stamped foliage image. I'm very happy to share the results in Dawn's challenge. 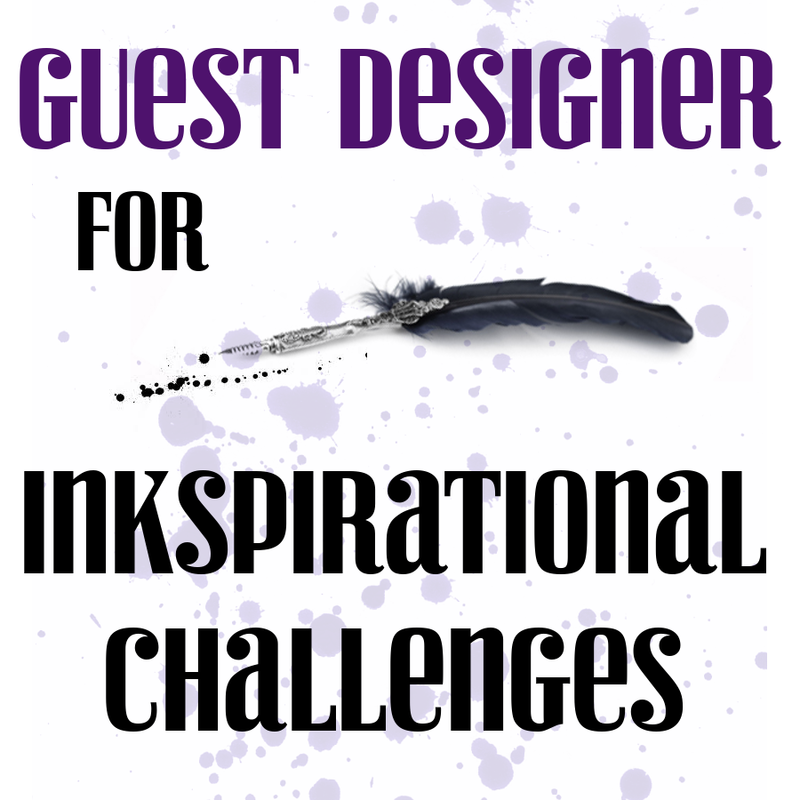 Inkspirational Challenge #184 - Pop it up! I have a confession to make. I don't always plan ahead. Lots of times I decide I want to use an image or two or more and I go ahead and stamp them and/or fussy-cut them and colour them. And I put them aside. A week or more may go by while I'm allowing my subconscious to "incubate" ideas. For me this system works. Suddenly I'll know what I want to do and it's full steam ahead. That's what happened while I was creating this card. I love the sweet images from the Fairy Celebration set. I've used them in many ways before but I keep coming up with new ideas. For me, this has definitely been a worthwhile purchase. 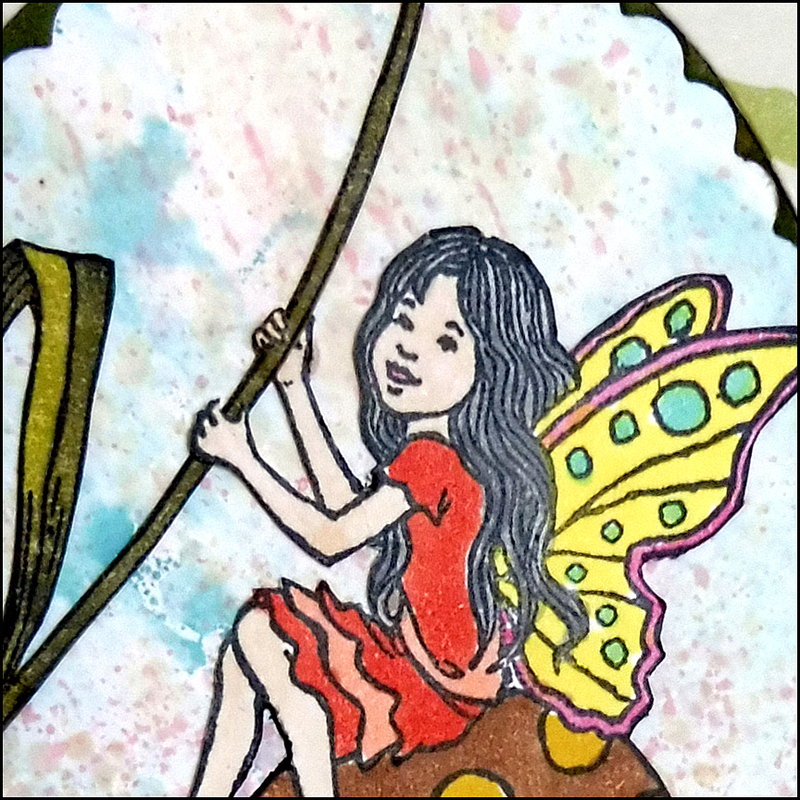 Being a glutton for punishment, I stamped the sweet little fairy on a scrap of Whisper White by inking the stamp with my Basic Black Stampin' Marker. That gave me a chance to eliminate the flower which the fairy is actually holding as well as the other flowers in the image. I had a different idea in mind. Since it's the beginning of Spring and I'm just dying to see some daffodils, I wanted her to be holding one. There was a perfect image in the You're Inspiring stamp set. Of course that daffodil was one of two on the stamp and so, again, I inked only the one which I wanted. As if that wasn't enough work, I decided to fussy-cut the images as well. Have you noticed the detail, especially with the grasses and those little arms and legs? Besides my little "snips", I had to use my special kraft knife and mat. But I had an end goal and that was that. To tell the truth, the hardest part of all was cutting those tiny hands and fingers so that they could curl around the stem of the daffodil. My base is the Heavy Whisper White. Then comes a matte of Mossy Meadow. The next couple of layers actually have ovals cut into them and then the splattered layer was attached under those layers with the base of the fussy-cut Fairy image between. 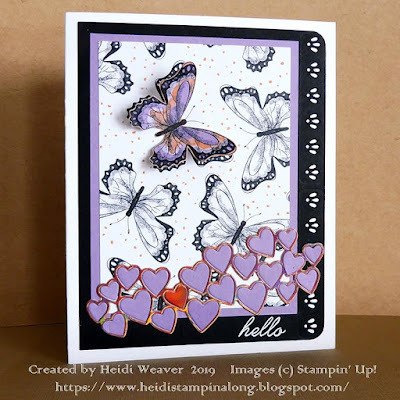 I decided that I needed a little something to balance the die-cut and stamped sentiment at the right bottom and so I fussy-cut one of the butterflies from the Sale-a-bration Botanical Butterfly DSP. I think it worked out just right. 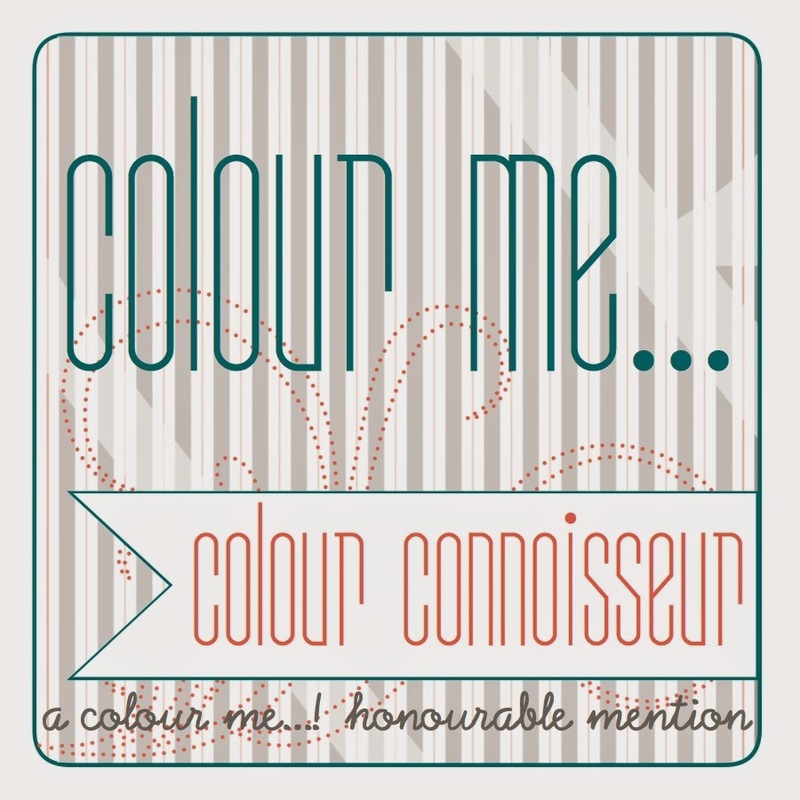 It echoes the colours in the fairy and the Floral Romance Specialty DSP. 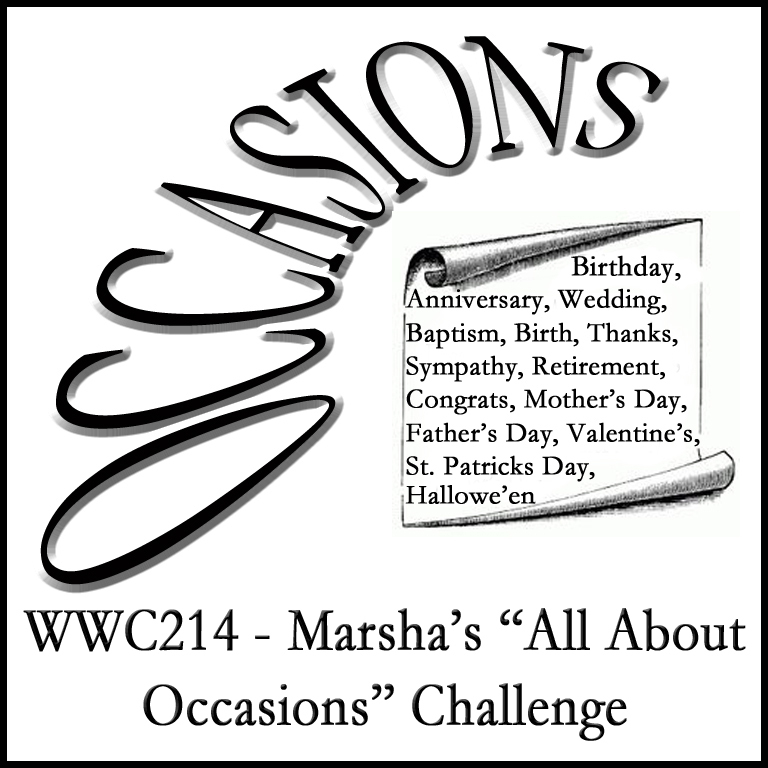 I love our "All About Occasions" challenges, don't you? This time of the year, especially, they give me a chance to put together some fun Easter projects. I have two grandsons and one of the things both love about Easter is the hunt. We can only hope that the snow will be gone this year and that it isn't replaced by rain. Paper products just don't do all that well when it's wet, nor do the yummy chocolate-filled eggs in these little baskets. I have to give credit to Angie Juda for this pattern. Although I made a few cosmetic changes, I stayed true to her measurements. If you click on Angie's name, you'll find the instructions, a great video and an awesome template. 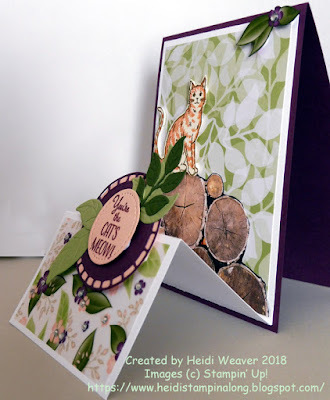 I've combined the newest Sale-a-bration paper, the Painted Seasons Designer Series paper, with one of the absolutely adorable stamp sets from the Occasions Catalogue, the Fable Friends set. I love that bunny because he makes me think of Peter Rabbit and, of course, that makes me think of poor Mr. McGregor who was forever trying to save his carrots and cabbage from the marauding bunnies. Yes, I know those are flowers on the Designer Paper, but look at them sideways and squint, and they make perfect cabbages. 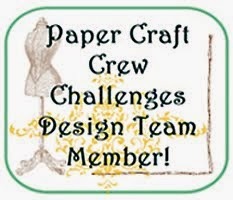 I've used Crumb Cake for the basic baskets and then added the pieces of Designer Paper. For the bunnies, I stamped them on pieces of Whisper White, cut them out using the Stitched Oval Framelits and then coloured them using my Stampin' Blends and Watercolour Pencils. The Matte is Call Me Clover, which is one of the colours in the Designer Paper. 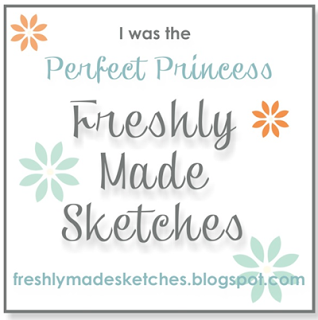 I bought a new stamp from Impression Obsession and I believe I'm obsessed. In the course of a week I've made three cards with it. Each time I've made one, I've thought of a different way I could have used it. Oh yes, it is definitely obsession. Luckily it works perfectly for our challenge this week which is a Masculine "Anything Goes", hosted by Karen. 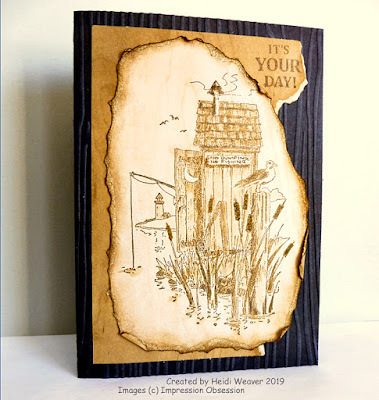 For my first card I had the idea of giving it a wood-burning sort of style. 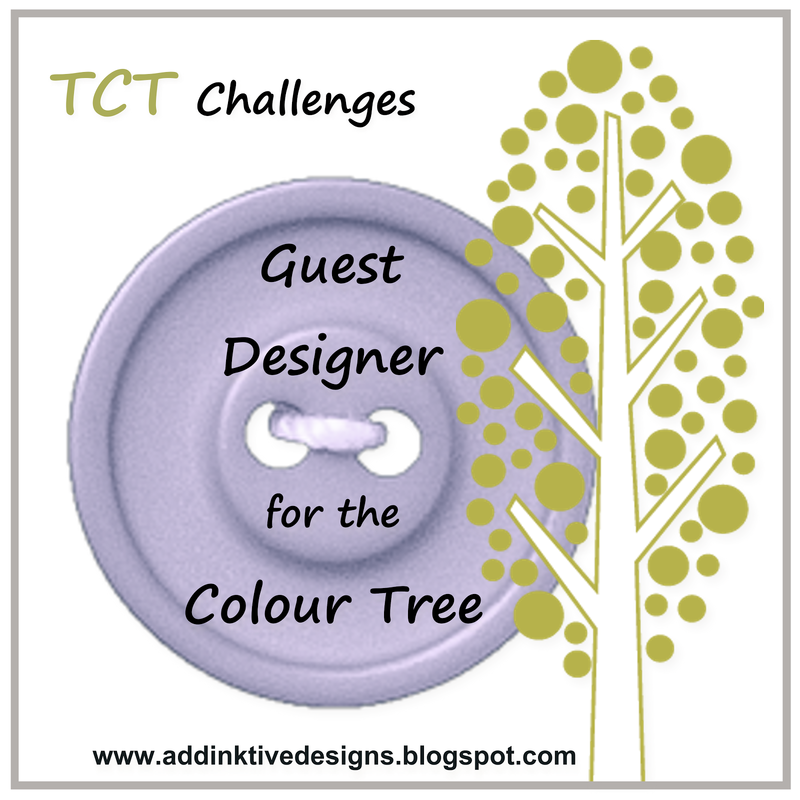 I used a light coloured pattern from the gorgeous Wood Textures Designer Series Paper and stamped the image using Soft Suede. I heat dried that to really set the ink and then used my AquaPainter to lightly add some Crumb Cake, Soft Suede and Early Espresso to the image to add to the wood-burned style of it. Once I was satisfied, I ripped around the perimeter and proceeded to sponge the raw edges as well as distress them. I love the aged look it gave the paper, don't you? For my base I used Early Espresso and used the retired Wood Grain embossing folder on the front. I added a layer of the Wood Textures DSP in a slightly darker shade, but which coordinated with the stamped piece. I'm really happy with the rustic, vintage style of it. A couple of days later I just had to try it again on another piece of the Wood textures DSP, but this time I chose a white birch look. The shabby white-washed piece was perfect to stamp on with my Vintage Photo Distress Ink. It had the same tone as the distressed part of the patterned paper, but slightly lighter. After stamping, I didn't add any colours but instead, used my distressing tools on the edges to make the stamped piece look old and shabby. I used the retired White Naturals cardstock as my base and a piece of Soft Suede as the matte. 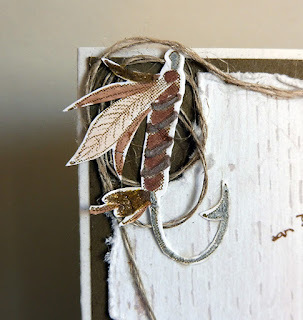 In the top left corner I added a stamped and die-cut fly-fishing hook from the Best Catch bundle and, after colouring it in neutrals, attached it over a piece of linen thread. I like the look of that hook in the corner, don't you? It finishes the card off quite nicely. And then I got the bright idea to stamp the image on Whisper White cardstock using my Black Memento ink. After that had dried nicely, I got to work colouring the image using my Faber-Castell coloured pencils and Gamsol. For this one, I used a base of Heavy Whisper White and then double-matted with Gray Granite and Basic Black. So you can see what's kept me busy this past week. I had to satisfy my obsession so that I could begin thinking about other stamps. Yay! 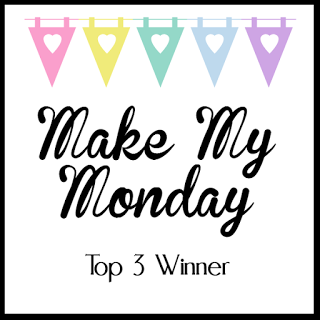 I made the top three! 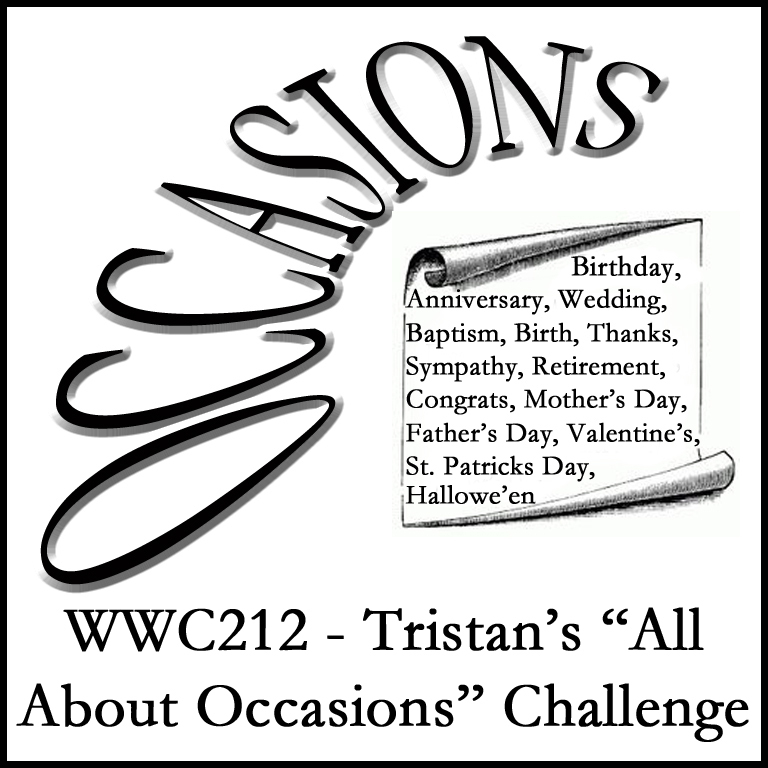 We're having an "All About Occasions" Challenge hosted by Tristan this week. I love the possibilities that are offered by this challenge. 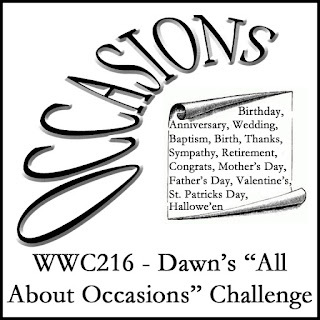 So many big and little occasions happen in our lives all year long. 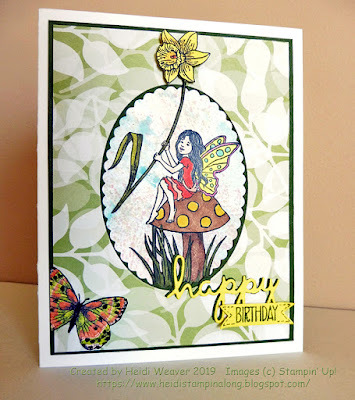 I also love that I had an opportunity to use a brand new Happy Hoppers stamp created by Ellen Jareckie. Isn't that a fun image? 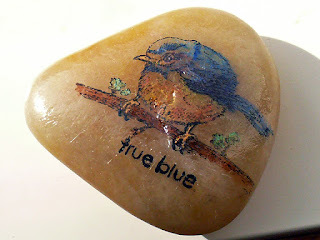 Stampendous offers all these wonderful images created by Ellen Jareckie in rubber stamps. I wound up with a perfectly crisp image which I had a lot of fun colouring with my Aquapainter and several of my ink pads. The umbrella is Rich Razzleberry, the raindrops and puddle are Balmy Blue, and the adorable little frog is a combination of Pear Pizzaz and Mossy Meadow. 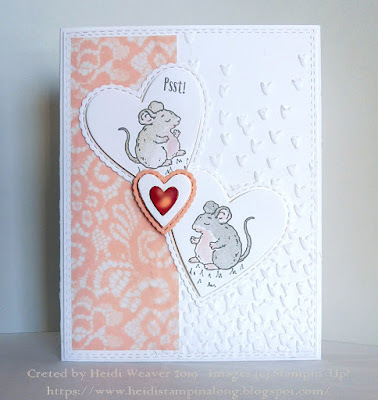 For the bunny's fur I changed to my Stampin' Blends and used the Crumb Cake and Petal Pink. That lovely patterned piece with all the watercoloured dots is from the Share What You Love Specialty Designer Series paper. I've taken all my colours from that paper (except the frog). My two slanted pieces of cardstock are Grapefruit Grove and Tranquil Tide. I love the way the colours and images came together. I think someone's spirits are going to be lifted with this little card. 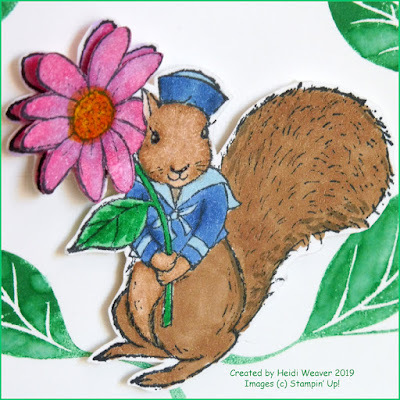 I hope you'll check out the wonderful creations by the Watercooler Artists over at our Watercooler Wednesday Challenge and also welcome our brand new Watercooler Artist, Michelle Wallace. 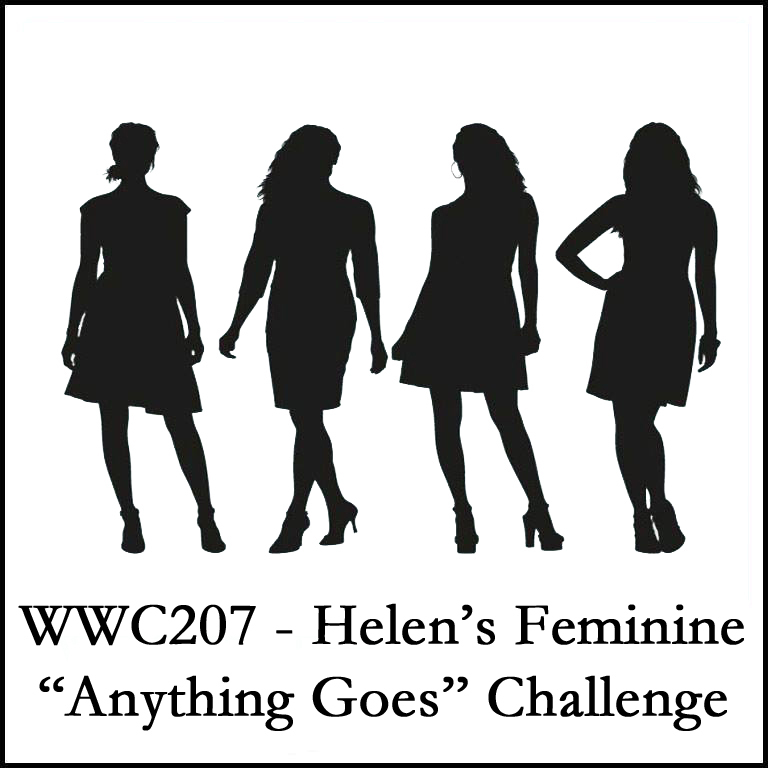 This week's Watercooler Wednesday challenge is an "Anything Goes" with a feminine twist. Fun? Of course it is, especially with that gorgeous Botanical Butterfly Designer Series Paper which I got through my Sale-a-bration credits. Oh...and there is a huge surprise inside. My base is Basic Black and then I've simply added a layer of the Botanical Butterfly DSP. The paper I've used is so elegant with its black and white design, isn't it? I love those butterflies! 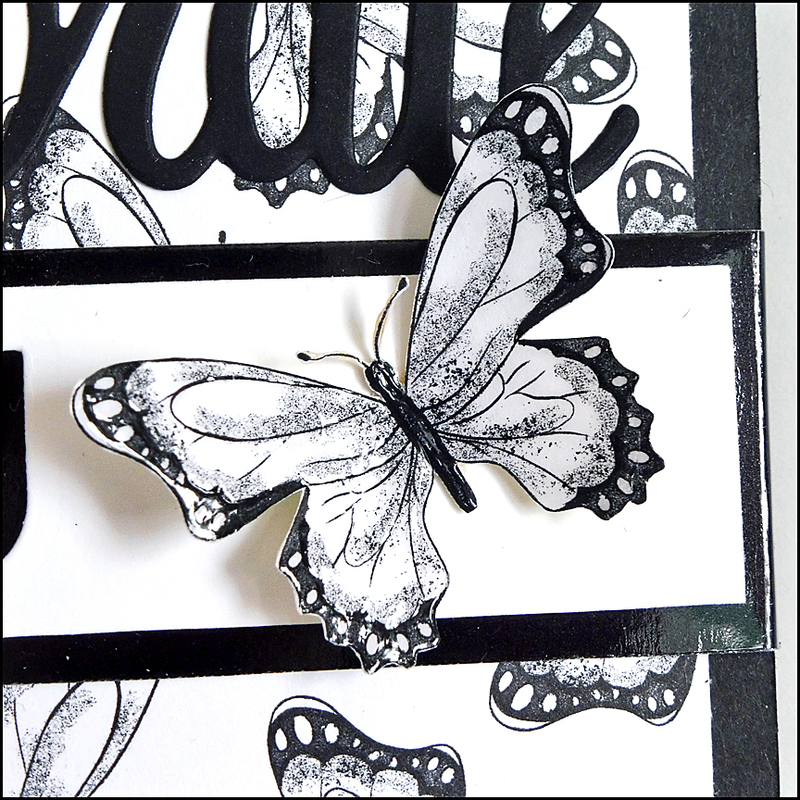 Beside using one piece for the front of my card, I also fussy cut one butterfly from a small leftover piece. 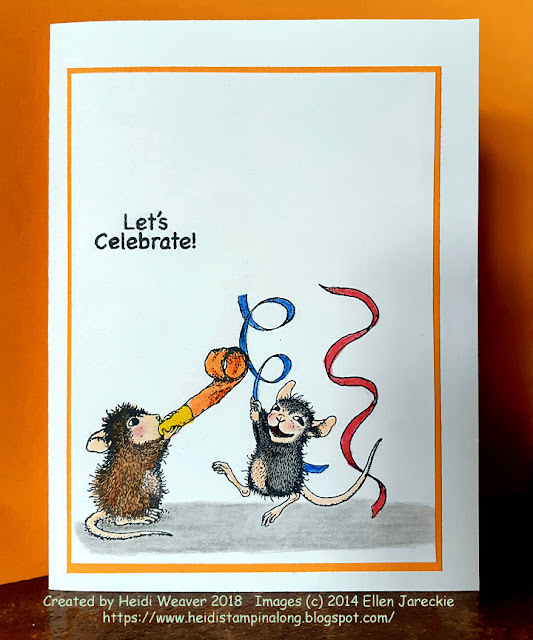 The way I've designed the card, I also had the opportunity to finally use the dies from the Celebrate You thinlits. 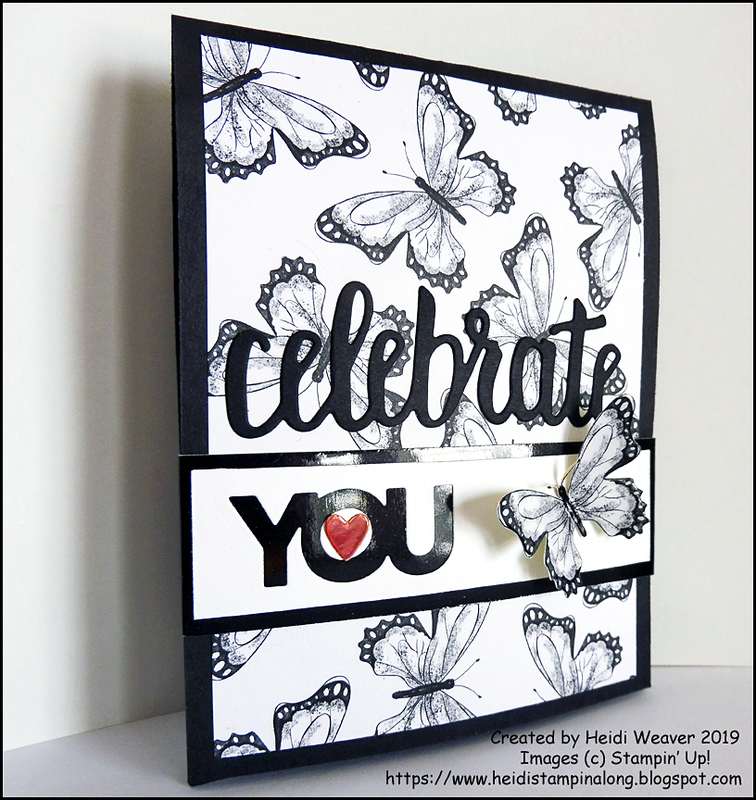 What looks like a narrow panel with a butterfly and die-cut "YOU" is actually a belly-band, holding the card together. I've posted a close up of the butterfly because it is actually covered on both sides with a layer of clear Nuvo crystal drops. The result is a butterfly that appears to be plastic rather than paper. The awesome part is that the antennae (yes, I fussy-cut those, too) are nice and strong. I've used the retired Petal Passion Designer Series Paper because its simple black and white design is perfect for this card. Each of those coloured butterflies is from the Botanical Butterfly DSP and, yes, each one has been fussy-cut. Sometimes I wonder if I'm a glutton for punishment. 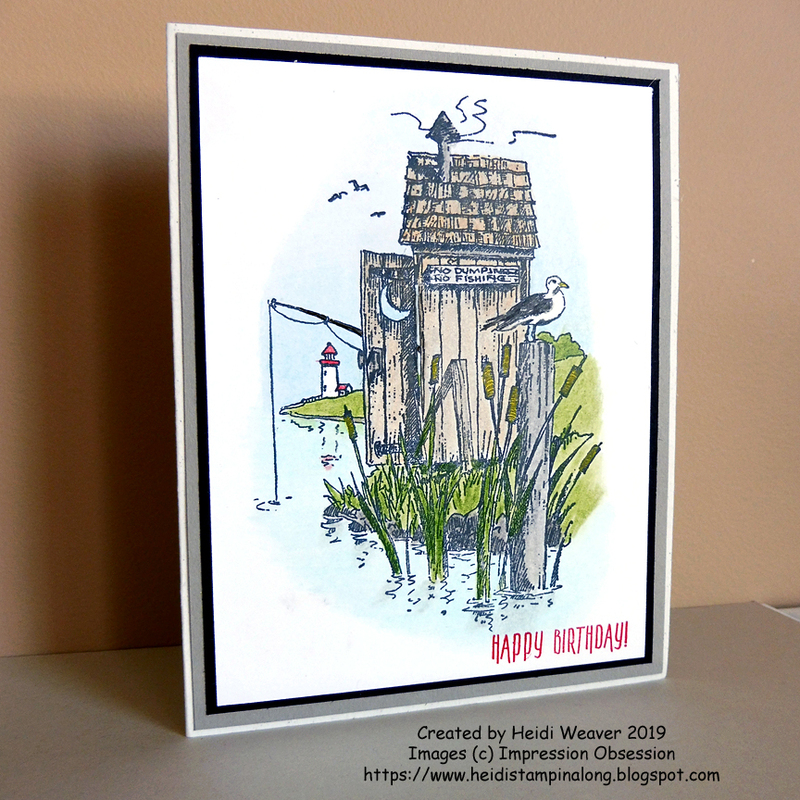 The "Happy Day" die cut on the top panel is actually the wonderful Happy Birthday thinlits die with the "birth" missing. I love how this Twist Pop Up card turned out, don't you? 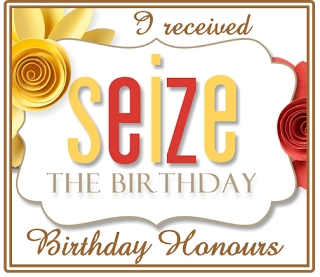 Oh, I love special occasions, don't you? 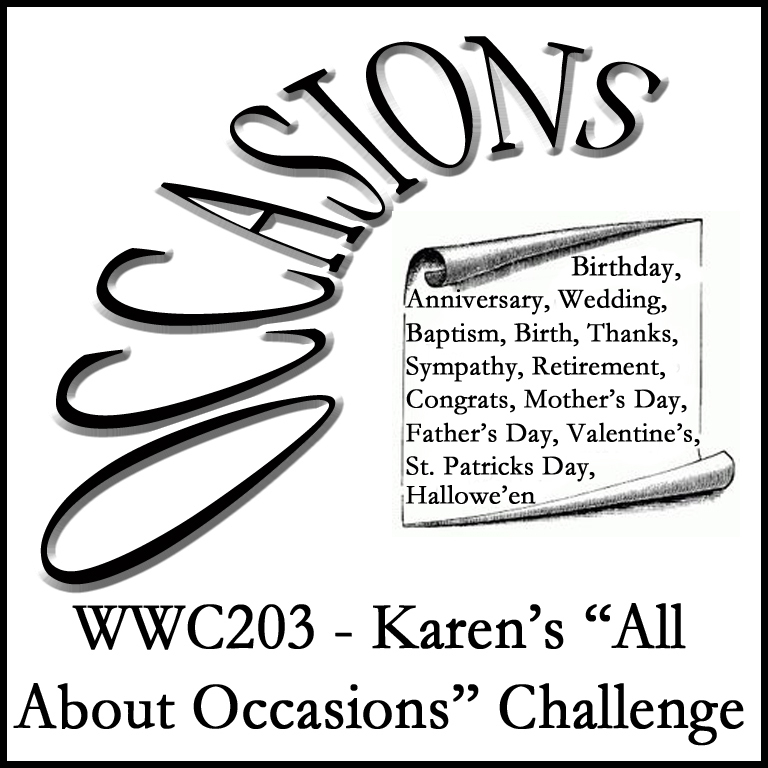 For this challenge, I decided to use that adorable Sale-a-bration So Hoppy Together stamp set and the new framelits that compliment it. How perfect for a special birthday! I decided to use Basic Gray cardstock as my base and then added a layer of Crushed Curry before adding the stamped Whisper White layer. I stamped the unicycle slightly crookedly since I intended to have my frog counterbalance by standing on the seat on one leg. Yes, this is a very daring frog! 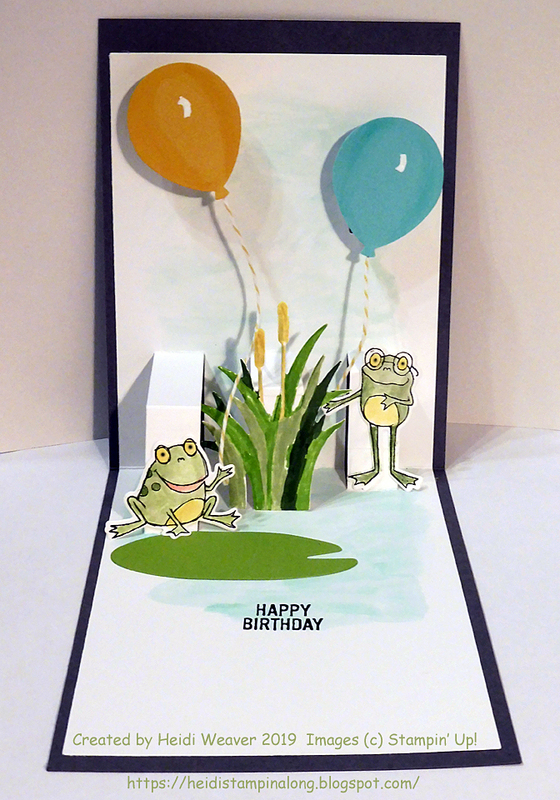 I used the framelit die to cut out the frog image and then coloured it and attached it using Dimensionals for a 3-D look. Above the frog, I added two mosquitoes (flies?) which I had stamped and cut out using the framelit die. 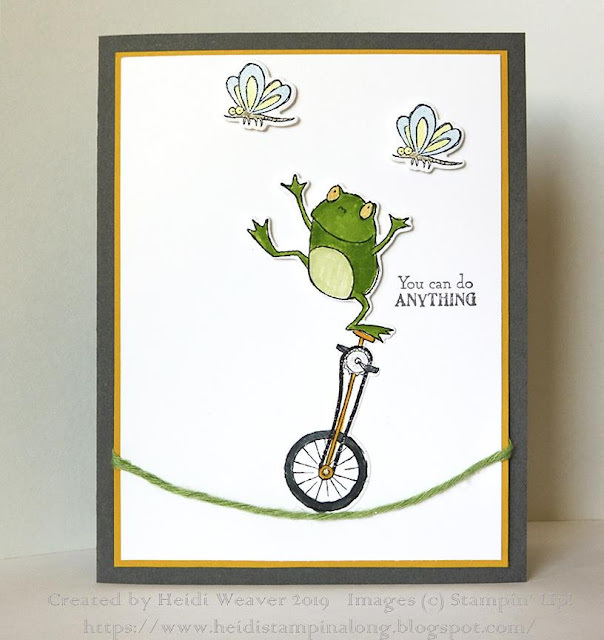 I wasn't entirely certain when I began the card, whether I would have the unicycle balanced on a lilypad or on a tightrope. In the end I chose the tightrope, to add to his daring feat. I think the green retired thick baker's twine is perfect, don't you? Since the front of my birthday card is relatively simple, I decided to add a little special something to the inside. what could be better than a little pop-up scene? For that I combined a number of products including the So Hoppy Together bundle. The grasses in the centre are die-cut using the Catch of the Day thinlits dies. The little frogs and lily pad are from the So Hoppy Together bundle and those cute balloons were cut with the Balloon Bouquet Punch. What fun! This week's challenge, hosted by Marsha Reed, is our Masculine challenge. 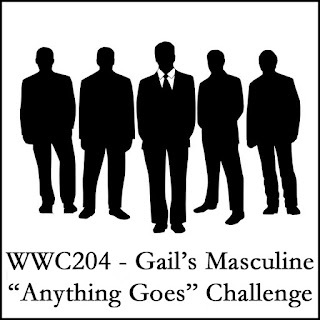 Better still, it's an "anything goes" challenge. 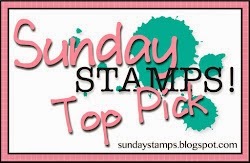 And there is one bundle in particular from the Stampin' Up! 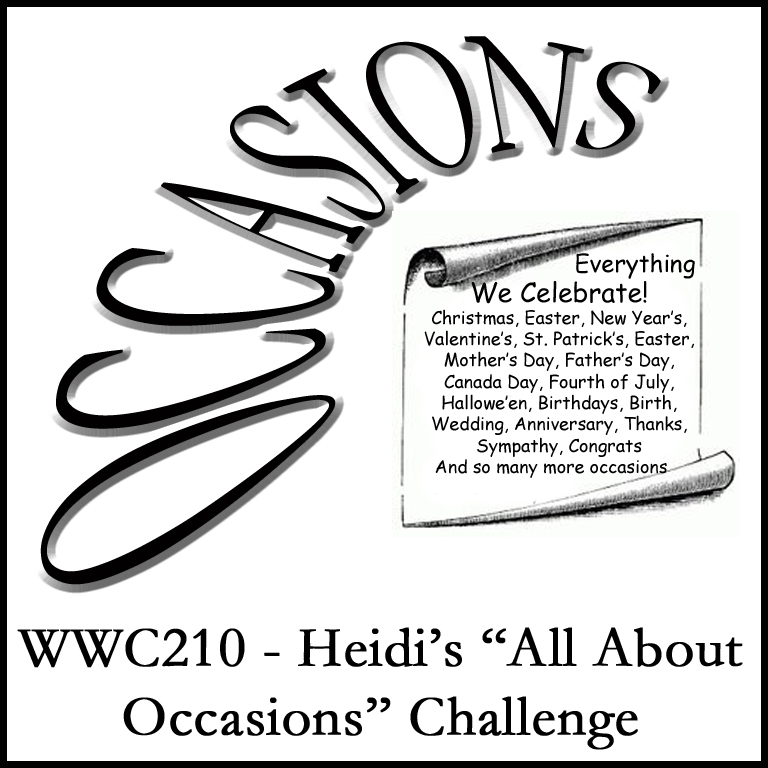 Occasions catalogue, which is perfect for this challenge. Wait till you see what I did with the Classic Garage Suite. 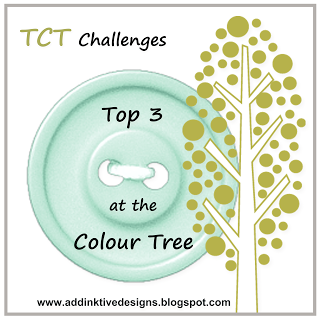 I took the colour inspiration from the gorgeous Classic Garage Designer Series paper. That led to a base of Basic Black, a layer of Tranquil Tide and a layer of Crushed Curry, all colours in that wonderful designer paper which is the next layer. Don't those tire tracks in all those colours look amazing? Among the designs in the paper stack, there is a page all in black and white, featuring classic cars. I fussy cut the one featured for this card and used Dimensionals to attach it to a strip of prepared Crushed Curry cardstock. How did I prepare it? 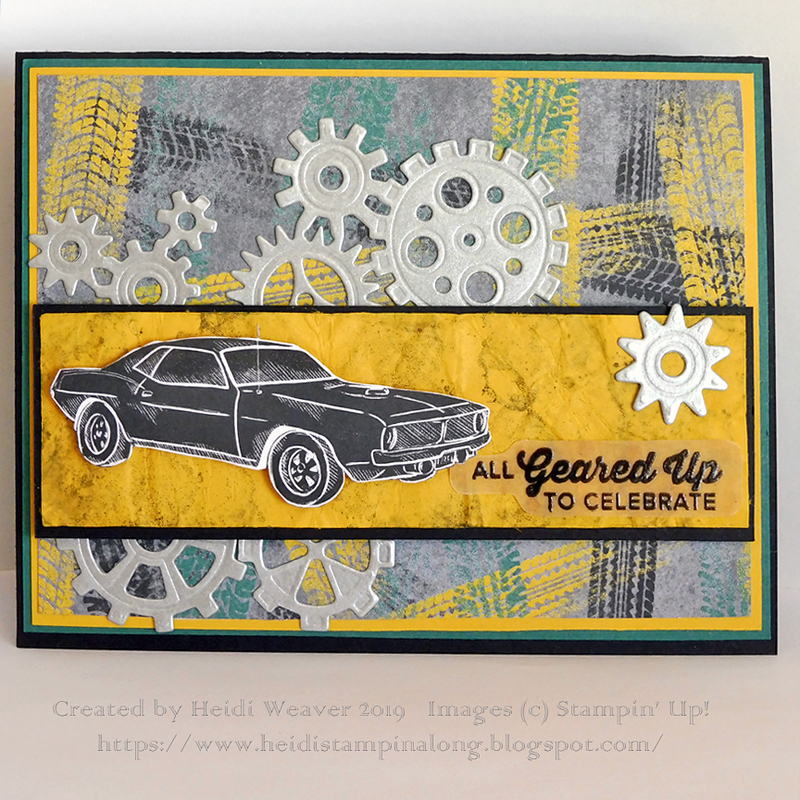 First I stamped it with the "oil spill" image from the Geared Up Garage stamp set using Gray Granite ink. Then I sprayed it liberally with water and scrunched it tightly into a sort of ball, squeezing the cardstock tightly. After a few moments, I straightened it and put it under some weight to dry. I love the rumpled, worn finish, don't you? While that was drying, I cut a bunch of gears out of the Galvanized Metallic paper which is, unfortunately retired. I love the dull metallic look to that paper, don't you? I glued the gears randomly and then attached the strip of "beat up" Crushed Curry, matted by a piece of Basic Black. I saved one gear to attach to the top right corner. Then I heat embossed my sentiment using Black Embossing Powder on a scrap of Vellum. Once that was cold, I glued that just under the gear. 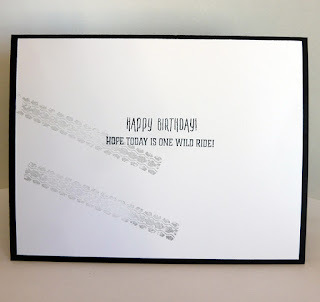 For the inside of the card I merely added a piece of Whisper White and then stamped the tire tracks from the One Wild Ride set using Smoky Slate ink and added the sentiment which is also from the same stamp set. 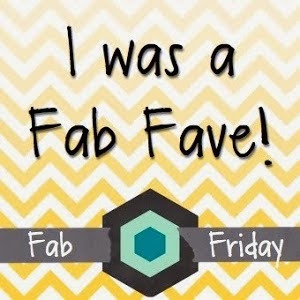 When I saw the Fable Friends stamp set in the Stampin' Up! Occasions Catalogue, I fell in love. Those little images remind me so much of the wonderful characters in some of my daughter's "read-to-me" books. Nostalgia made me buy them. Since the challenge for which I decided to use this set asked for Navy & Yellow, the ducklings were a sure pick. 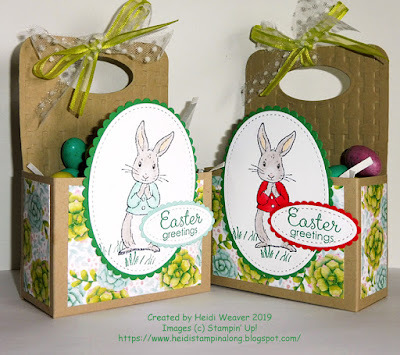 I stamped them, coloured them with a combination of Stampin' Markers and my Blending pen and then began the meticulous job of cutting them out. On a piece of Whisper White cardstock, I used my AquaPainter and Night of Navy ink to create a puddle and shadows near the bottom. Then I used the clouds and raindrops from my retired Weather Together stamp set to finish the simple rainy scene. At the very bottom I stamped a sentiment which is also from the Weather Together set. 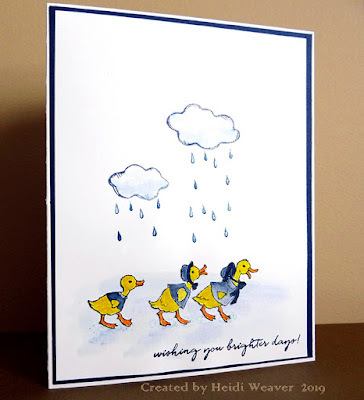 Having glued the ducklings down to join with the shadows I painted, I took my glaze pen and created little swirls to give the illusion of puddles. I also put a spot of glaze onto each raindrop. To finish, on a base of Heavy Whisper White, I used a matte of Night of Navy and then attached the stamped scene. I love the results and hope you do as well. 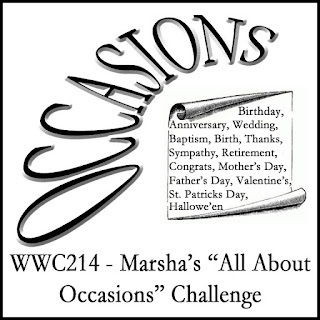 I love our "All About Occasions" challenges! They're perfect for all sorts of celebrations throughout the year. 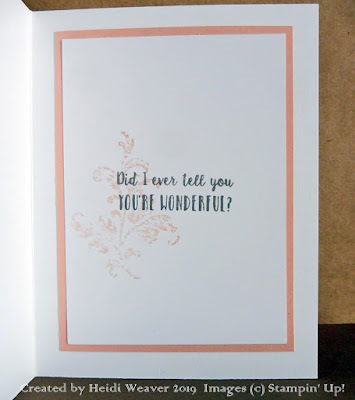 This time I decided to go all romantic with a Valentine's Day card using colours inspired by the gorgeous vellum pattern in my favourite Specialty Designer Series paper, the Floral Romance. 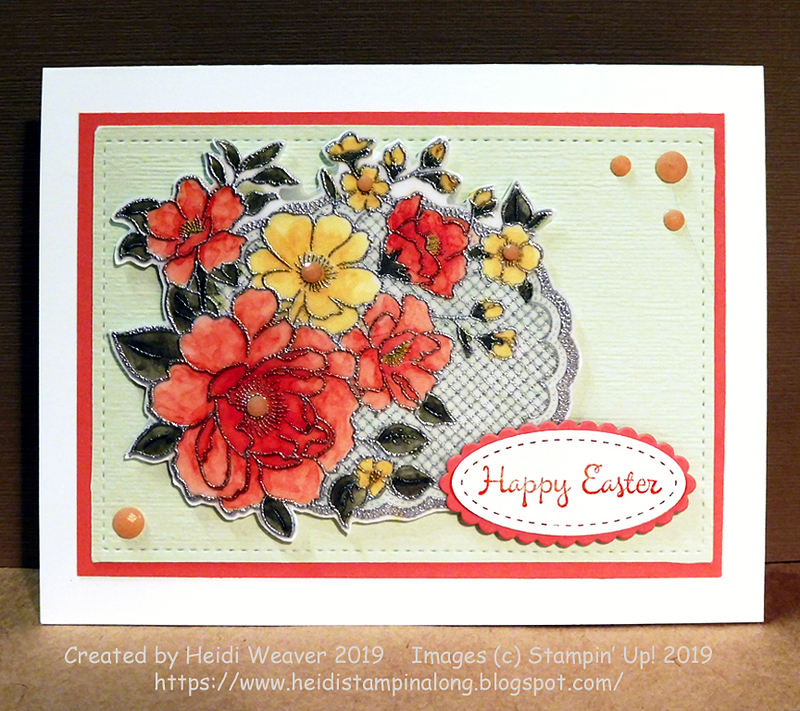 I used that pretty Vellum patterned paper along the left side of the card and complimented it along the right side by embossing the Whisper White layer with the retired Falling Petals embossing folder. Since I love those darling little mice from the Sweet Storybook set, I stamped one on each of two Whisper White hearts which I cut using the Be Mine Stitched Framlelit dies. I love that there is a scalloped stitched piece to be used as a matte for the simple hearts. I also cut a much smaller heart from a piece of Petal Pink cardstock to link the two larger hearts and also to compliment the Petal Pink in the patterned Vellum. I wanted a smaller Whisper White heart to pop on top of that scalloped Petal Pink heart but there wasn't a die in the right size and so I cut another scalloped heart from a small piece of Whisper White and then simply cut off the stitching and scallops and had the piece I wanted. For the centre of that white heart, I cut a small heart from the gorgeous Sale-a-bration Grapefruit Grove foil sheets. That foil is amazing because it looks a different colour from every angle, just like an opal. For the inside of the card I used a matte of Petal Pink behind a piece of Whisper White and then stamped the pretty flourish from the Timeless Textures set using Petal Pink ink. The sentiment is also from the Sweet Storybook set. Remember, you can get the Grapefruit Grove Foil free with qualifying purchases from Stampin' Up! until March 31st. I love our feminine challenge! 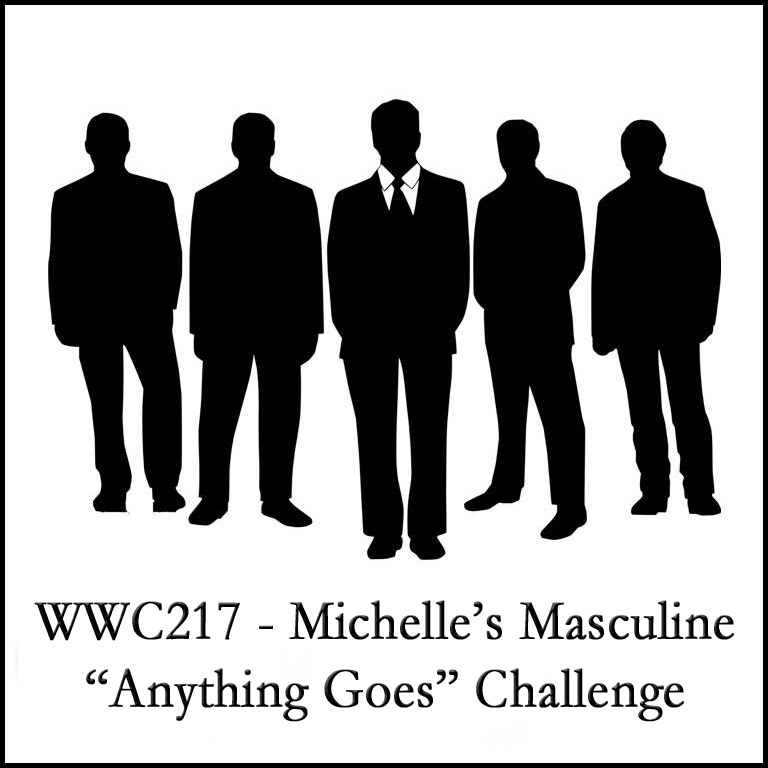 The best part, in my opinion, is that it's an "anything goes" challenge so, as long as I stick to a feminine theme, I can do anything. 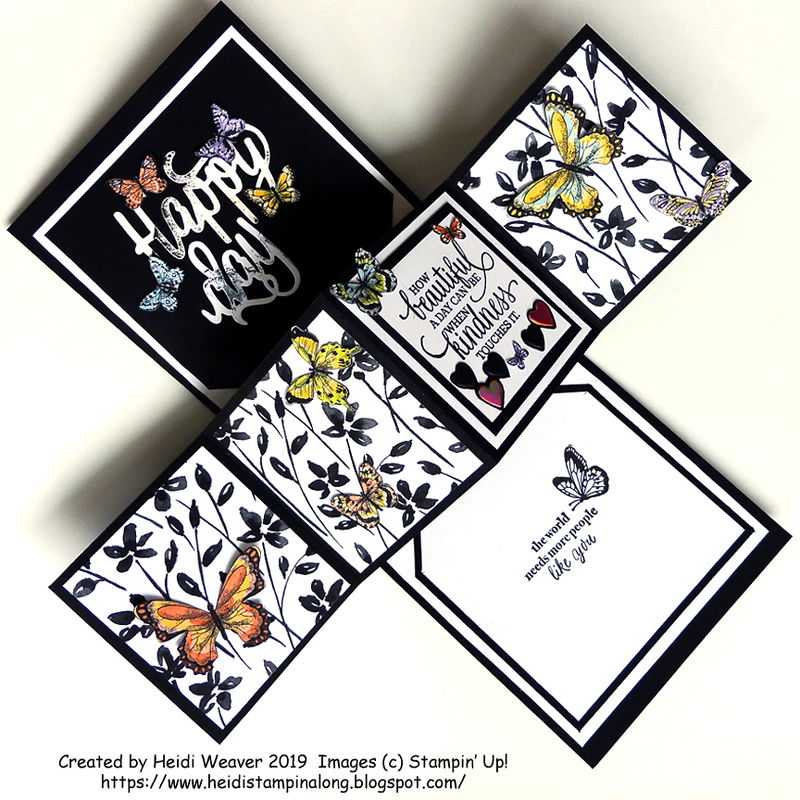 This time I decided to give some love to the gorgeous Sale-a-bration Botanical Butterfly Designer Series Paper, among other products. I began with a base of the Heavy Whisper White, followed by a layer of Basic Black which I first cut along the right side using one of the border framelit dies from the Be Mine Stitched Framelits dies. Just for fun I also rounded the upper and lower corners on that side using my Detailed Trio punch. Then I added another layer, this time the lovely Highland Heather. 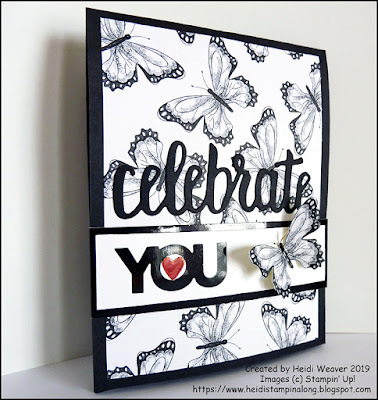 For the "main image" I turned to the Sale-a-bration Botanical Butterfly DSP. 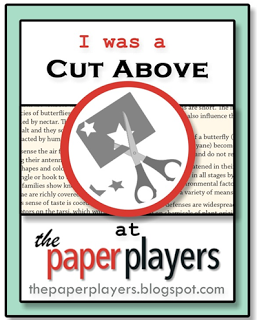 I decided to cut a piece of the black and white butterfly print. Then I chose a beautifully coloured butterfly from another sheet and fussy cut that to be glued on top of one of the black and white butterflies. I only glued it along the centre so that the wings appear to be ready to take off at any moment. 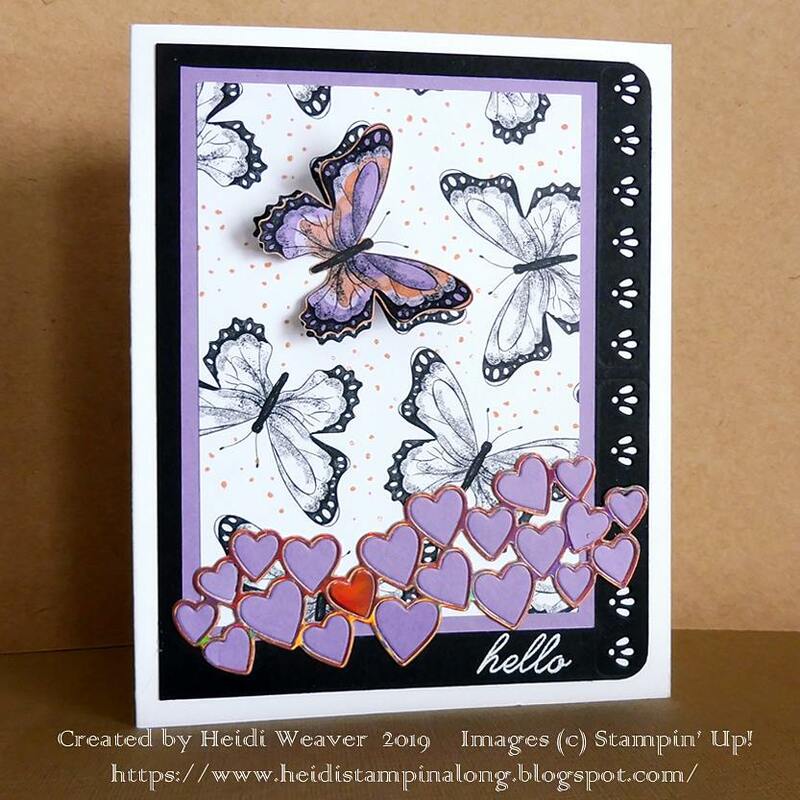 As you can see, that coloured butterfly is what helped me to choose the colours for this card. Along the lower border I decided to use the open, connected hearts die, also from the Be Mine Stitched Framelits dies. I first cut a piece of the Sale-a-bration Grapefruit Grove Foil and then cut a piece of the Highland Heather cardstock. When I attached the openwork hearts, I did so at a slant so that there would be room for a heat-embossed white sentiment. Then I proceeded to glue in the hearts cut from the Highland Heather. I left one heart open and glued in the appropriate Grapefruit Grove Foil heart. I wasn't completely happy with the card at this point. It seemed to empty between the butterflies. So I took the small random dots stamp from the Wonderful Romance stamp set and proceeded to fill in the white using Grapefruit Grove ink. I think that was just what the card needed, don't you? 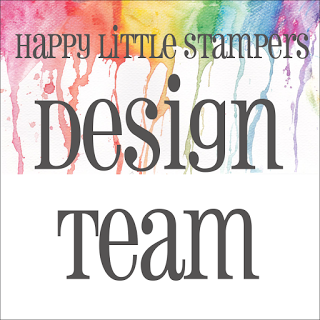 Remember, you can get the Grapefruit Grove Foil and/or the Botanical Butterfly DSP free with qualifying purchases from Stampin' Up! until March 31st. 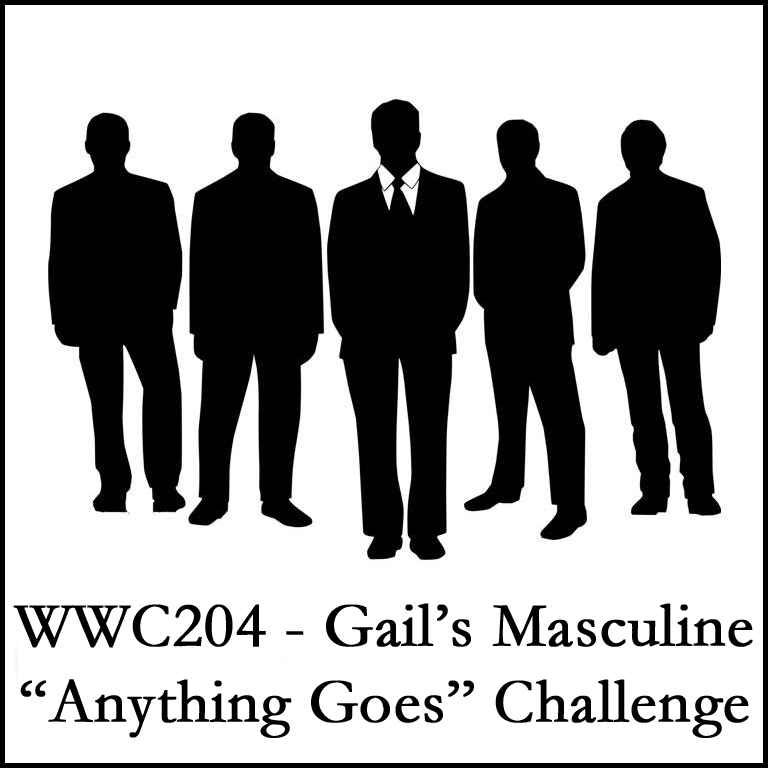 It's the fifth week of January and so the theme for our Watercooler Wednesday Challenge is "Anything Goes". 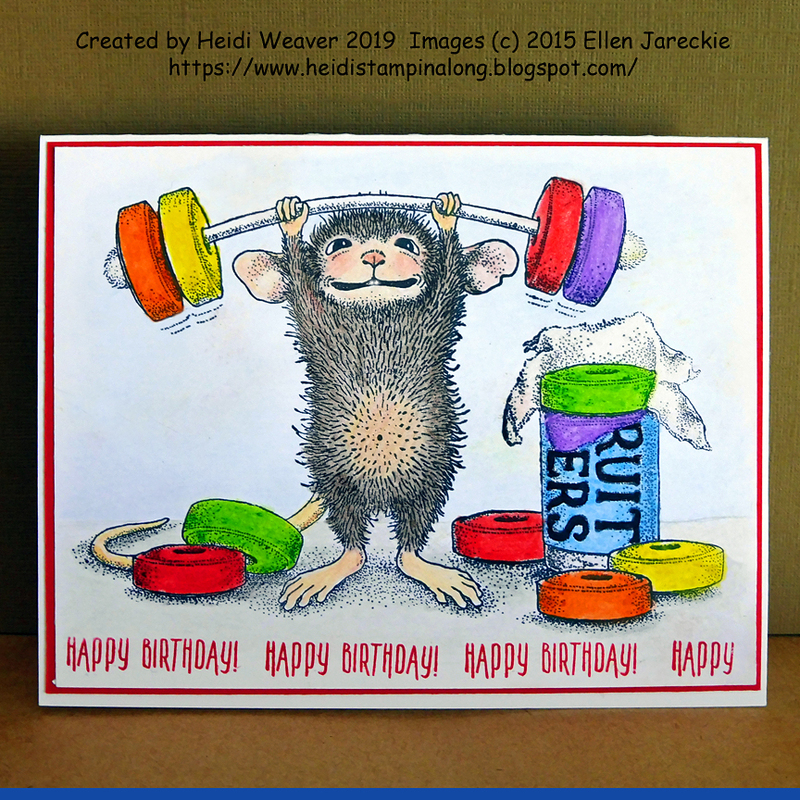 What could be better than using the brand new House-Mouse Design, "Sweet Workout"! It's a huge stamp but, oh, was it ever fun colouring it and bringing it to life! I love the detail in this image, don't you? I decided to use my Faber-Castell colour pencils and Gamsol for this. I find layering the colour and blending it with the Gamsol and my little Blending Tortillons really added dimension to the images. After colouring the adorable little Mudpie Mouse and the tasty looking fruit candies, I added a soft grey to the floor and a soft blue to the wall. 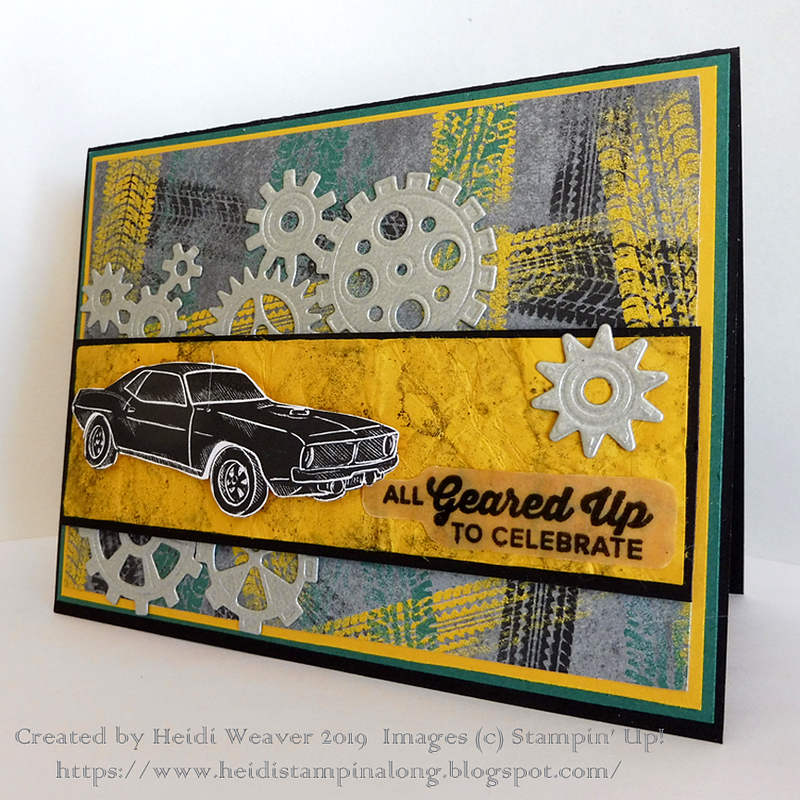 The Poppy Parade cardstock came closest in colour to those yummy looking candies and so I used that as my matte. 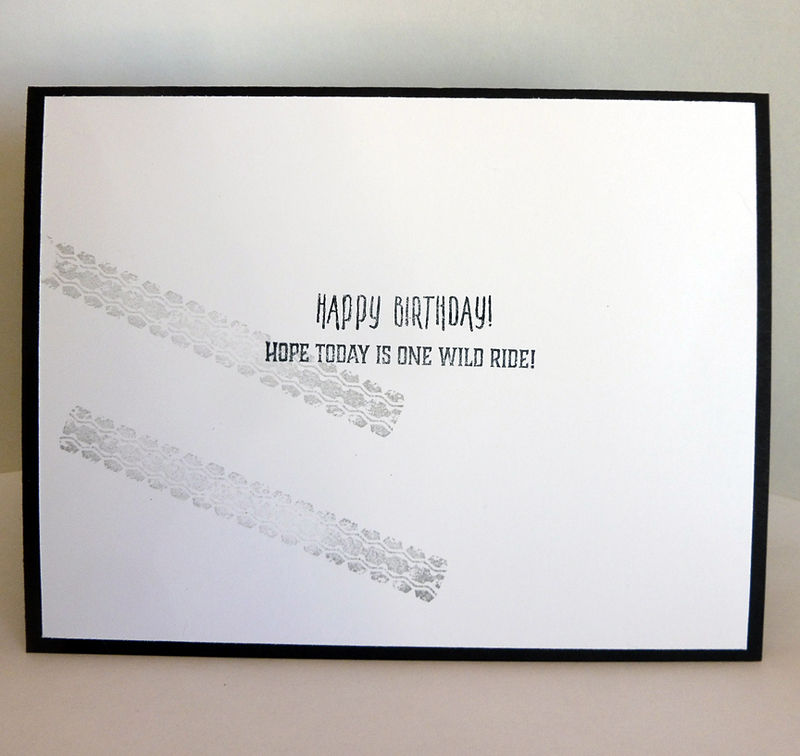 Of course I stamped the Happy Birthday sentiment using the same colour of ink. My base for the card is the Heavy Whisper White cardstock. I love the "All About Holidays" challenge but decided that I had to get away from Christmas cards this month. What could be better than making an Easter card, especially since I was dying to use the gorgeous new Sale-a-Bration stamp, Lovely Lattice. 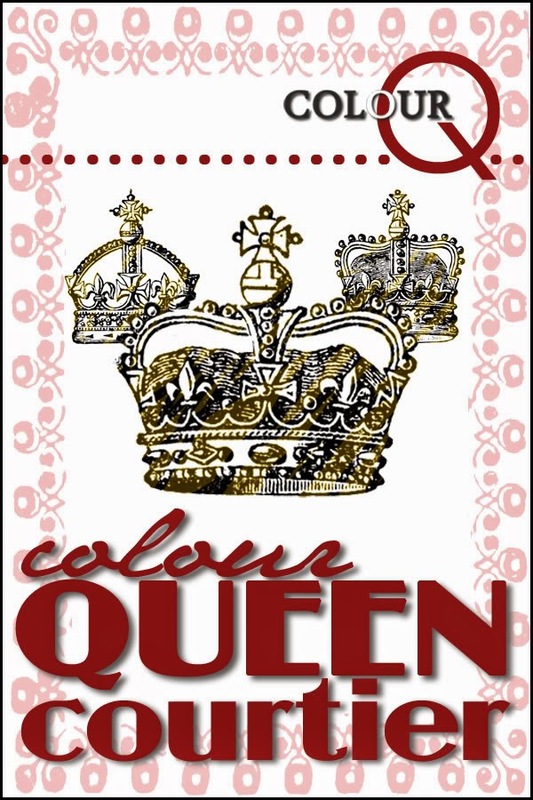 I love the colours I chose for this card, don't you? My base is the Heavy Whisper White followed by a layer of Calypso Coral and then a layer of Soft Sea Foam. Before adding the Soft Sea Foam, I ran it through my Big Shot in the Subtle embossing folder and then cut it using the lovely stitched Rectangle framelits. For the actual image from the Lovely Lattice stamp set, I decided to heat emboss it onto a piece of vellum cardstock with the Silver embossing powder. Once that dried and cooled, I carefully fussy-cut it out. 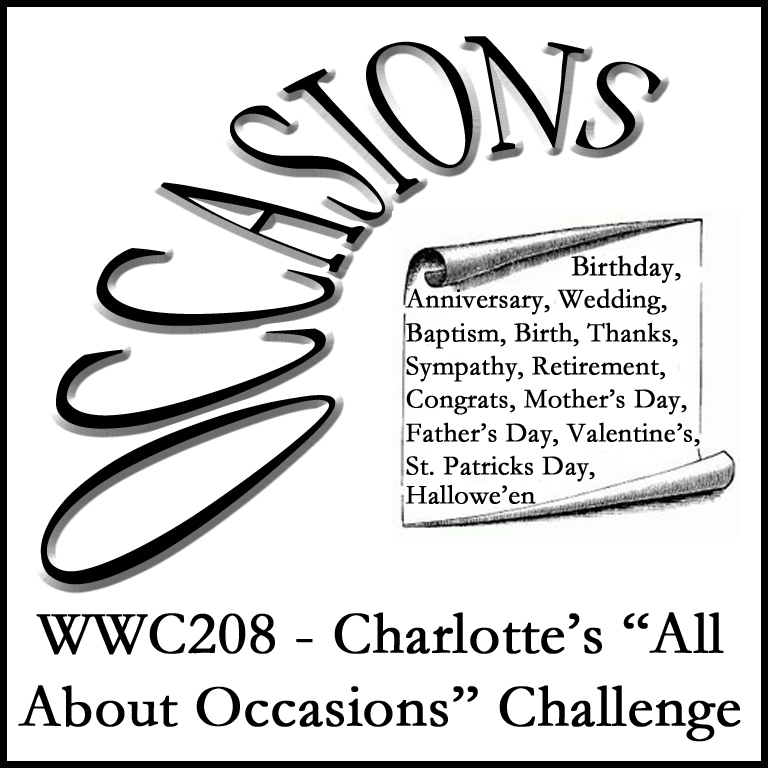 Then I used my Calypso Coral, Old Olive, Mango Melody, Daffodil Delight, and Mint Macaron Stampin' Blends to colour the image from the back of the vellum. I love the beautiful colours and especially love the look of the coloured vellum. For the sentiment I turned to the You're Inspiring stamp set because of its size and the pretty Font. 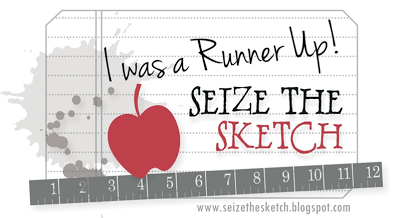 It's stamped with Calypso Coral ink and then cut out with the stitched Oval framelits. The matte is cut out of Calypso Coral with the Oval framelits. 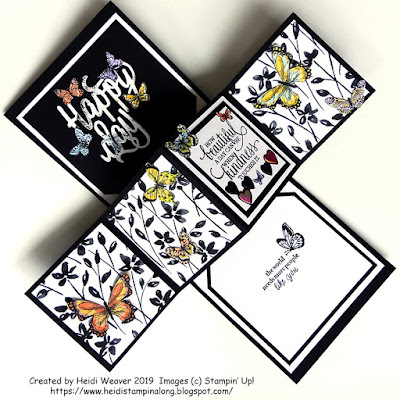 Remember, you can get the gorgeous Lovely Lattice stamp set free with a qualifying purchase from Stampin' Up! until March 31st. 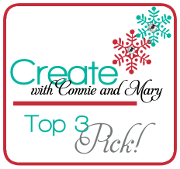 And let's not forget that the talented Sandie Munro is our Guest Designer this week as well. 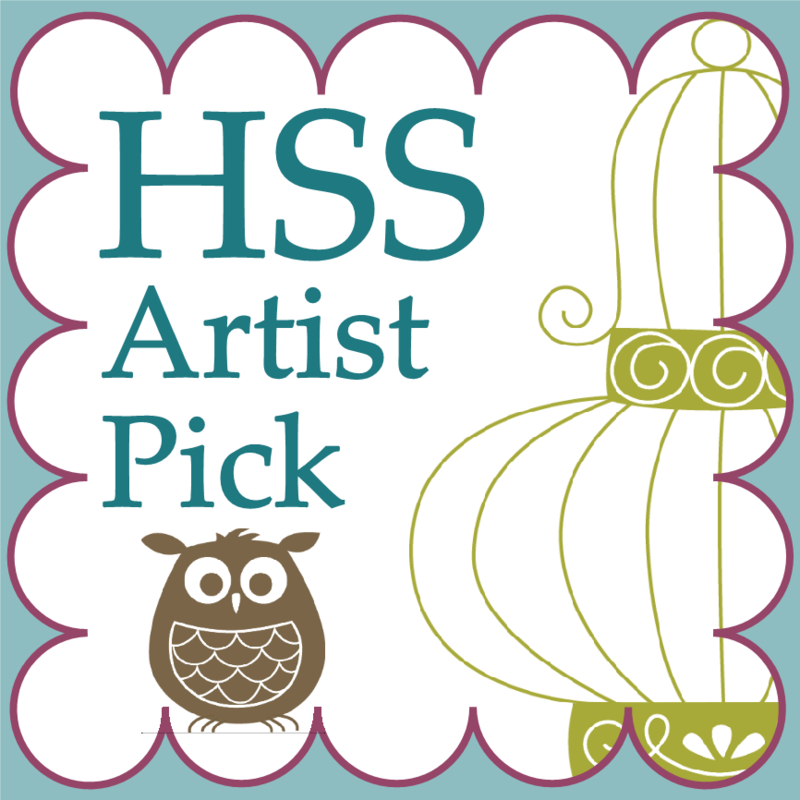 Check out her work and the wonderful creations by the Watercooler Artists over at our Watercooler Wednesday Challenge. 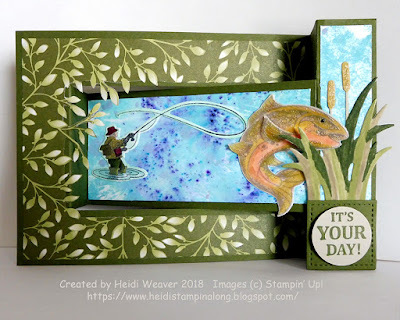 Both my husband and my son-in-law are avid fly-fishermen and so the brand new Best Catch bundle in the Stampin' Up! 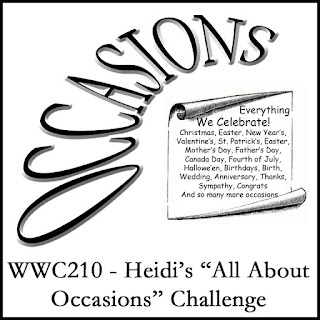 Occasions Catalogue was on my very first order. I used a special "X" fold for this card because it added dimension and spotlights the action. I thought the wonderful Floral Romance Specialty Designer paper would be perfect for the card and so I took all my greens from the paper. The hardest thing about the card, I will admit, was the fussy-cutting I chose to do along the left side of the card. I wanted those leaves hanging over the opening and love the effect, don't you? 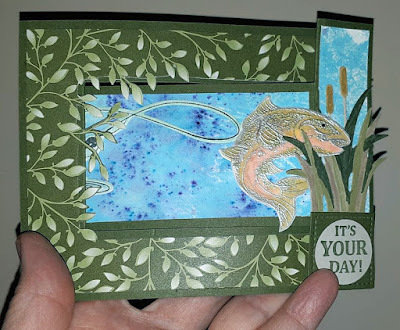 For the base of my card I used the Mossy Meadow cardstock. I love the way it compliments the other colours and also gives a real "out-in-the-woods" feel to the card. For the narrow panel I made a background using my re-inkers and some of my Brushos. It looked like moving water--perfect for the die-cut fisherman. For my fish I wound up using two layers. 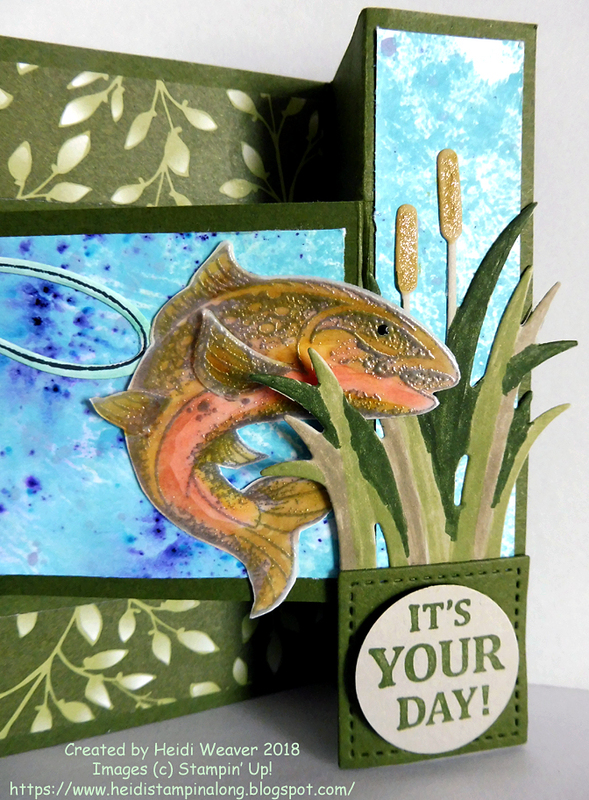 The top layer is vellum onto which I've heat embossed the trout using silver embossing powder. Then I used my Stampin' Blends to colour both the front and back of the vellum. I found that intensified the colour, which I was hoping it would. The second layer isn't stamped at all, but is merely a piece of Whisper White which I've also die-cut with the same die. It really helps the colours to "pop". The reeds and grasses are included among the dies in this bundle but don't have a stamp to go with it. 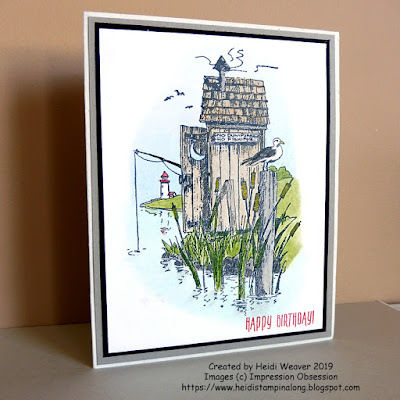 I found it was easy to colour the grasses and reeds using my Stampin' Markers. The cattails have an extra glow thanks to my Wink of Stella. Finishing off, I stamped the sentiment on Whisper White, cut it out with my 1" punch and then mounted it on a square of Mossy Meadow, cut with the smallest of my Stitched Squares. 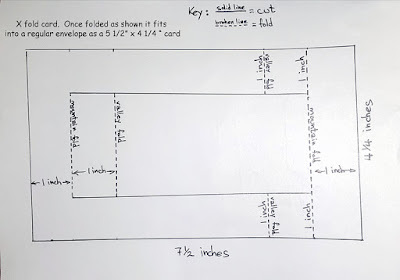 The above pattern should help should you wish to try this fancy fold pattern. I am super-exited to announce that I was the winner of the top prize at the House-Mouse & Friends Challenge for this card. What a super celebration! 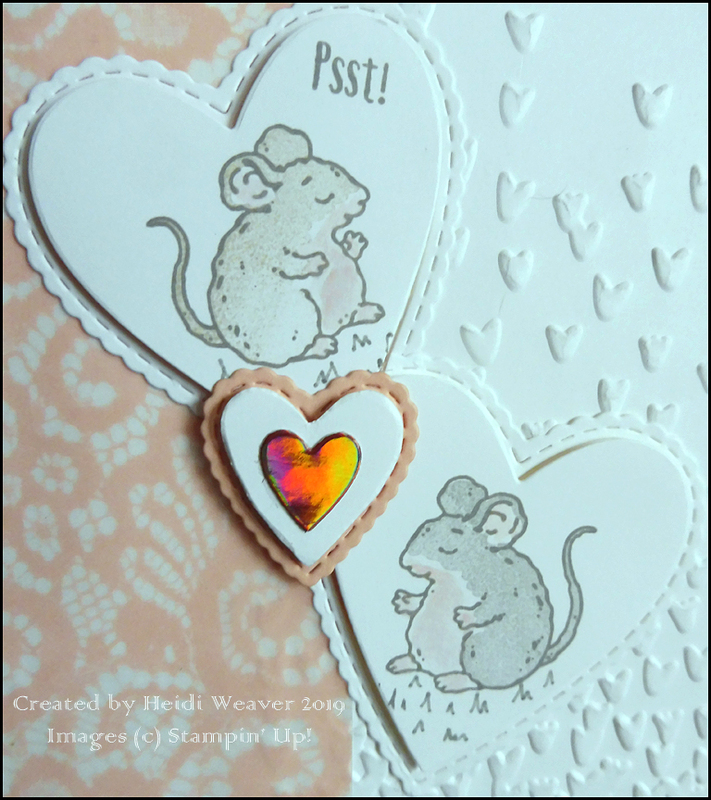 I was so excited to have found this wonderful House Mouse stamp set! 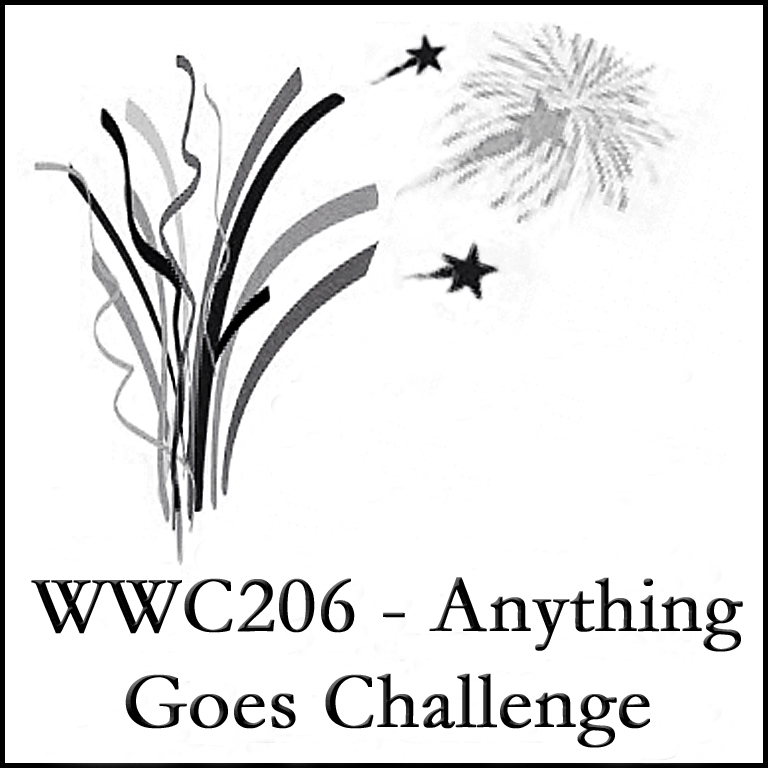 It's perfect for this week's challenge, too, since it's quite normal to celebrate occasions, isn't it? Happy New Year, everyone. 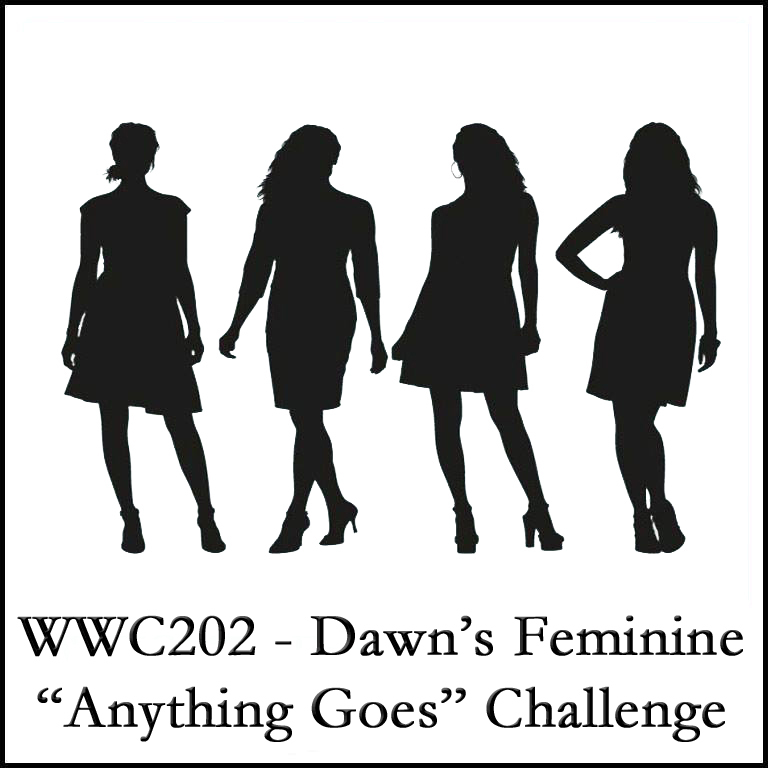 I'm excited to show off the card which I created for Dawn's Feminine "Anything Goes" Challenge. 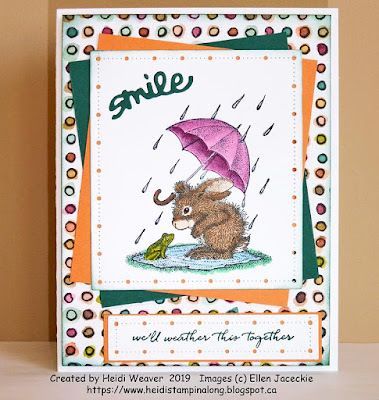 It's a fun (and easy to do) double easel card. 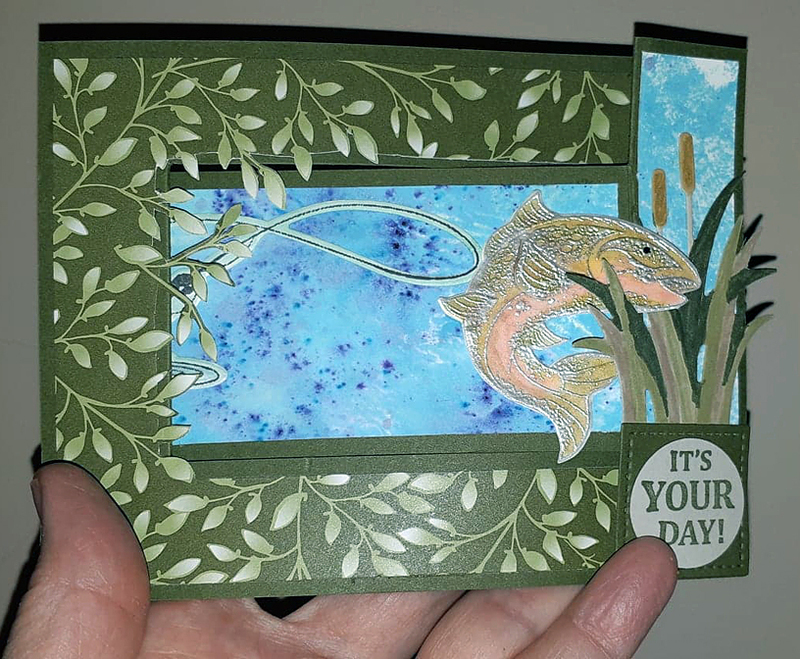 I created this card after seeing Rick Adkins' lovely double easel card. I love special folds and this one is showy but, oh, so easy. 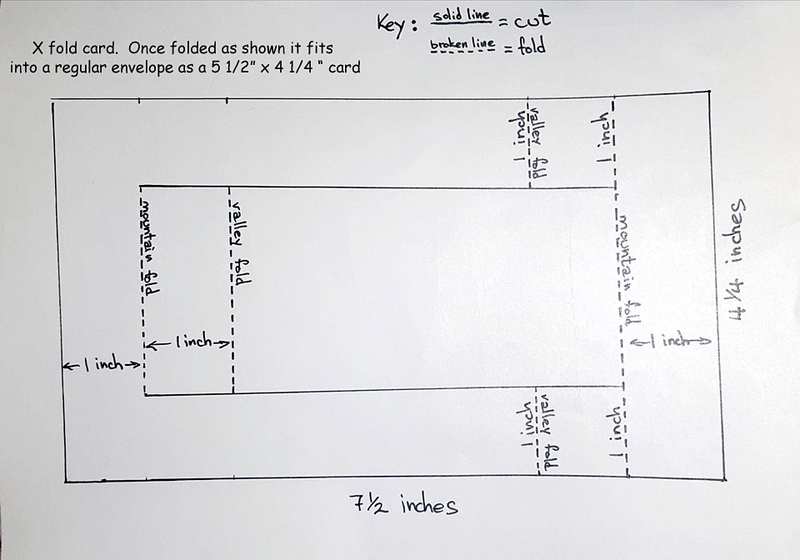 If you want the instructions and measurements, they're all over on Rick's post. I have to admit that I've fallen madly and deeply in love with the Floral Romance Suite. 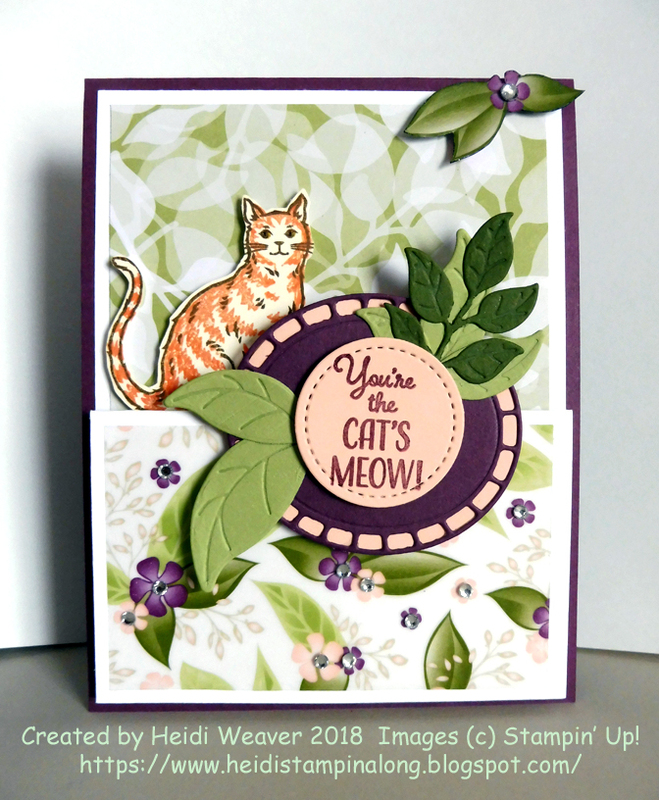 For this card I used some of the gorgeous Floral Romance Specialty Designer Series paper. The leafy background is a normal, two sided print while the design in the foreground is only printed on one side and is vellum. Set against the white background, the colours really shine. I cut the twig and leaves with the Wonderful Floral Framelits dies and love the way they emboss the veins of the leaves so deeply. Of course I had to use the new Nine Lives set. I still have the cat punch which goes with this stamp set and love that I can stamp so many types of cats. Don't you just love the orange tabby? He's happily sitting on some of the logs which I cut from the Wood Textures Designer Series paper. 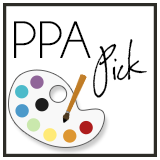 After all, he doesn't want to be hidden behind the front easel. I hope you'll check out the awesome creations by the other Watercooler Artists over at our Watercooler Wednesday Challenge blog. 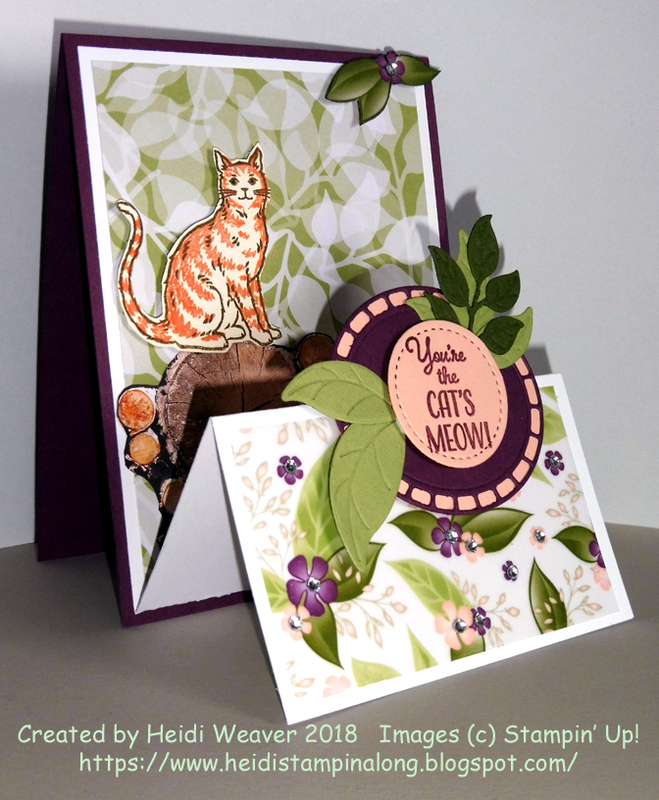 And, of course, enjoy the wonderful creation by our January 2019 Guest Designer, Sandie Munro.